Friday, October 3, 1913: Working for wages. Grandma worked long days on her father’s farm husking corn. Did she ever wish that she had a job in town—maybe as a clerk in a store? 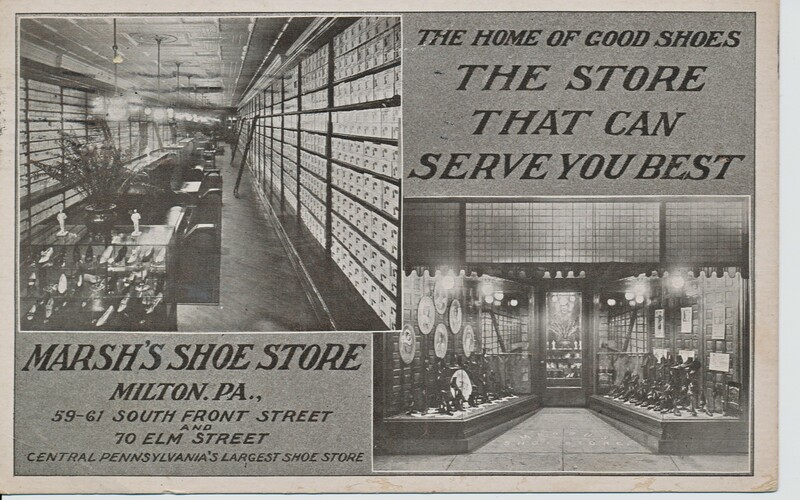 Postcard showing Marsh Shoe Store in the nearby town of Milton a hundred years ago (postally used December 1910). He hangs around me all the time. But he doesn’t get wise—he’s a lime. You’d think that he owned me, the slob! I owed him my life—and my job! Who tried to get merry with muh! Oh, wouldn’t he wallop him silly! And then for the ambulance—huh? Exactly the things that I think. And bounce him a biff on the map. Love Sonnets of a Shop Girl by Berton Braley was published in a 1913 book called Sonnets of a Suffragette. The entire book is available on the Internet Archive. Posted on October 3, 2013 October 3, 2013 by SherylPosted in OtherTagged 1913, family history, genealogy. I’ll be fascinated to hear more of any comments she made about farm work and whether she felt it restricted or enhanced her life. About about seven and a half years after this diary entry she married a farmer–so in many ways I think that her work on the farm during her teen years was preparing her for her future life. But, at the same time, a little piece of me thinks that she was very smart, and wonder if she was fully utilizing her abilities. Sheryl, thanks so much for bringing me forward in her story. From what you’ve posted, I’d certainly agree that she seemed very smart. Yes! So full of slang — and even the violence. that sonnet was AWESOME! What a wonderful find- thanks for sharing! I’m glad you liked the sonnet. Fast internet can make a real difference in what can be accomplished in a reasonable amount of time. I know that when my internet isn’t working quite right and is really slow that I get really frustrated. For us, it was unusable! Now I gotta get back in the habit of posting and reading! Amazing sonnet – life was certainly different for women in those days, wasn’t it?? It was often tough for women who worked a hundred years ago. I think that things are much better today–though sometimes I hear about harassment issues that make me realize that there are still occasional problems. A very good sonnet, that girl seemed to be a feisty and funny one! I hope she told of the flor walker indeed! I agree–sometimes I’m surprised (though maybe I shouldn’t be) that there are similar issues today. It’s fun to read some of the phrases that were used a hundred years ago. You do such interesting work. Best wishes! Have you ever read Sister Carrie by Theodore Dreiser? Touches on this stuff. Best yet is The Maimie Papers by Maimie Pinzer–actual letters by a girl of the times. A girl from the school of hard knocks. I thought of Sister Carrie, too, when I read this! I’m definitely going to have to read Sister Carrie. I’ve never read Sister Carrie (or the Maimie Papers), but I have read An American Tragedy by Theodore Dreiser. And, when I read this sonnet for the first time I immediately thought of that book. The story line was based on what happened after a factory supervisor had a secretive relationship with a young woman working in the factory. I just realized I haven’t read that book. I need to! Thanks for the tip. A biff on the map! Priceless. My husband’s grandfather used to ask, “Whaddya want, a biff in the bim?” This was the first time I heard anyone use the word “biff” outside of our family. Maybe it was better to be working on the farm! There’s definitely tradeoffs between different types of jobs. Thanks for the nice note. I have a lot of fun researching and writing the additional information that I include in this blog–and it’s always wonderful to hear when someone especially enjoys it. I thought of “Sister Carrie” when you mentioned the shop girl…then I read the “sonnet” and it’s more like one of those Betty Grable movies. Maybe with Don Ameche? It also reminded me a little of some of the old Marilyn Monroe movies. I read your comment above that seven years after your grandmother married a farmer. I think that was more common back in her era as a couple of my mother’s siblings went that way as well. these days the little farmers have been swallowed up by the large corporations and so we do not see individuals working on their own farms as much. sounds like a poem to me. haha. the words are fantastic! ah but yes, sexual harrassment does happen even in such modern world. and these days, men get it too. the table has turned for some.